(Henderson, Colorado)—February 13, 2013 – Lily Farm Fresh Skin Care and Lily Organics Farm, announces its popular Nourishing Facial Cleanser has been named one of the “Top Natural Beauty and Bath Products of 2013” by Delicious Magazine. The publication, dedicated to healthy, natural living, selected 40 top natural beauty products from hundreds of submissions. The criteria for winners included product purity and integrity, and formulations for the highest performance in each category. Products were not only rated on stellar performance, but also on honesty in labeling; something Lily Farm Fresh Skin Care adheres to not only because of their unwavering business ethics, but also because of the USDA certified organic seal proudly displayed on the product label and granted by the U.S. Department of Agriculture. The organic skin care line is also manufactured on a USDA certified organic farm, in a USDA certified organic laboratory. No other skin care line in the world can claim these credentials. “We are delighted to receive this prestigious award. Our nourishing facial cleanser is well received in the marketplace because of the results it gives women. They want organic and they want products that really perform on their skin and improve the texture and appearance. We give them both,” states Lily Morgan, Founder and Formulator of Lily Organics Farm Fresh Skin Care. “And, we spend all our time and energy growing the ingredients and making the products up fresh. It may not be a brilliant business plan, but it does make the best products for radiant skin.” States Lily, the 26 year veteran of the organic skin care industry and 7th generation American grower. 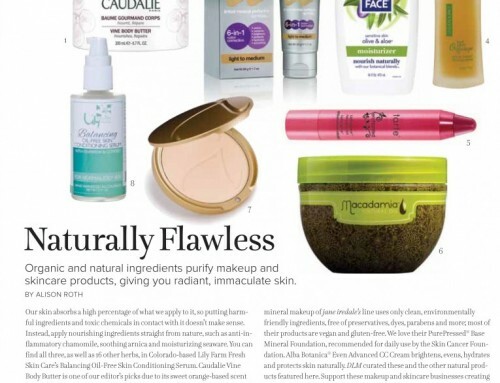 In addition to Delicious Magazine’s honor, Lily Farm Fresh Skin Care’s Rejuvenating Enzyme Mask was also recently named “Best Mask” by Healing Lifestyles and Spas for two years in a row as part of the publication’s 2012 Earth Day Beauty Awards.